I just got this great whetstone sharpener from Priority Chef. This is a really great way to sharpen your knives. It has two sides. There is a #1000 & #240 grit so you can both sharpen and finish your knives on the same stone. It has a great base you can use to keep it in place when you are using it. Very durable and easy to use. Really gets your knives super sharp, I have use it on several of my knives and I am very happy with the results. Razor Sharp Knives – Created with a different grade on either side, you can quickly sharpen the blade on one side, then flip it over and hone it to a perfect razor-sharp edge. Food Preparation Made Easy – A sharp knife makes all the difference in the world when both preparing and consuming food. The Priority Chef Whetstone Sharpener will get your blade ready quickly to help you prepare food more easily. Non-Slip Safety Base – You won’t have to worry about this whetstone sharpener sliding off the counter or out of your hand. Featuring a non-slip surface, you can grind safely and securely. Durable & Reliable – An uncompromising build quality means our whetstone sharpener is built to last. Don’t settle for anything less than highest quality for your knives, scissors and cutting utensils. 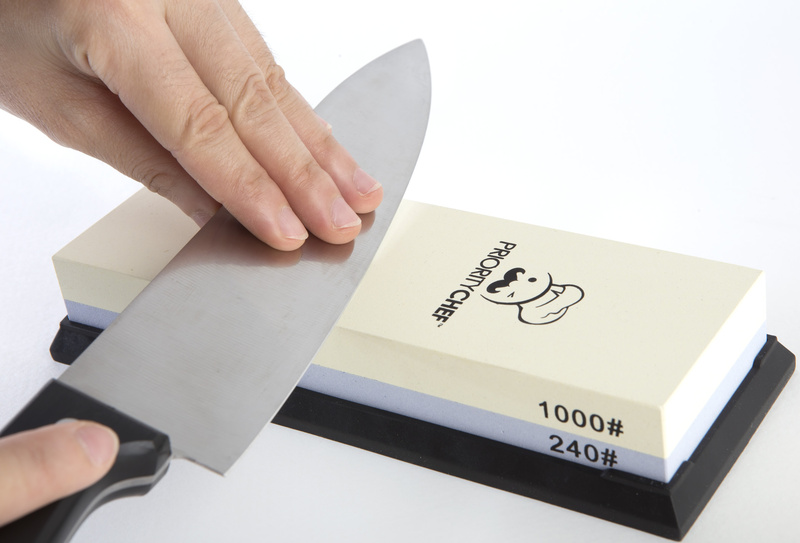 No Hassle Full Satisfaction Guarantee – If you’re unhappy with your Priority Chef two-Sided Whetstone Sharpener, contact us within 30 days and we’ll replace it or give you 100 percent of your money back, no questions asked.